One of the best rewards for writing the George R. Stewart biography and creating this weblog is the community of Stewart people who follow it. At the last count, there are followers in roughly 60 countries. This week, we’ve had visitors from the UK, France, Morocco, India, and the US. Some of those visitors leave comments, and I can begin to put a face on those people. A few, like Christopher Priest, are well-known, most simply Stewart aficionados . But all of the comments are interesting, and all of the visitors who comment enrich this work. At times, one of the visitors will point out some new GRS treasure. Ross Wilson Bogert, for example, who has become a good friend, brought the Wilson family into our dialogue – Stewart’s mother was a Wilson – and donated an exceptional 1929 film of Stewart and his parents at the Wilson house in Southern California. One theme that comes from reading the thoughts of others is the current rediscovery of George R. Stewart’s remarkable work. Although GRS seems not to be widely-known to the mainstream publishing/literary establishment, articles are being written about him, there are new reviews of his books and his work, and his ideas are being included in others’ work. One example is the one being discussed today, thanks to Joe Livak. Joe sent a comment last week about a new book which examines Stewart’s STORM from new points of view. The book, SNOWBOUND, by Mark McLaughlin, is available on McLaughlin’s website. Joe heard Mark speak about the book in Reno. McLaughlin, who studied cultural geography at the University of Nevada, Reno, is a prolific author and frequent public speaker on topics relating to the history of the Lake Tahoe region. He’s published hundreds of articles and several books, and regularly presents talks at various local groups, to high praise. McLaughlin’s new book describes the ten greatest storms to hit the central Sierra Nevada. On pages 58 to 60 McLaughlin takes a close look at Stewart’s STORM, digging into real events which he believes were likely inspirations for Stewart’s ground-breaking novel. McLaughlin also describes a couple of other storm-related tragedies, which had military connections but which Stewart does not include, speculating that he did so to respect the privacy of the families of the victims and also to protect military secrets. McLaughlin fleshes out his GRS pages with images of the front pages of local papers describing the events. My only small disagreement with his book is the idea that Stewart has been forgotten – that’s only true for the “establishment” mentioned earlier. Earth Abides, in particular, never out of print, is in 20 languages and is now slated to become a mini-series. It enjoys healthy sales to this day. Other GRS books are honored by other authors, like William Least Heat Moon, who devotes one section of Roads to Quoz to Stewart’s U.S. 40. U.S. 40 is also honored by Larry McMurtry in Roads. And the mother’s Fourth of July speech in Ivan Doig’s English Creek was inspired by Stewart’s Names On The Land. Slowly, GRS is returning to the attention of the public, and books like McLaughlin’s are a major step in that new awareness. Hopefully, the “establishment” will soon have a re-awakening of interest in the work of George R. Stewart. Thanks to Joe Livak for pointing us to McLaughlin and his work. For more information about Mark McLaughlin and this book, click the image below. After five years and 171 posts, reviewing George R. Stewart’s work, reporting on projects being developed to honor him, and describing his influence on human societythis web log about George R. Stewart has come to a milestone. The weblog’s author is moving. It’s been a luxury to have a comfortable place to research and write about him, and hopefully that’s been reflected in posts that are longer and more readable than ones written on the fly. Now, the author is leaving his comfortable office, and heading out to seek new adventures. This means that there may be gaps in the posts, and posts may be less developed. Fortunately, this is a milestone in other ways. For one thing, all of his major work has been described here on this site. So without reading all of Stewart’s books, the fans of some of them can see the intellectual and artistic context in which they are placed. 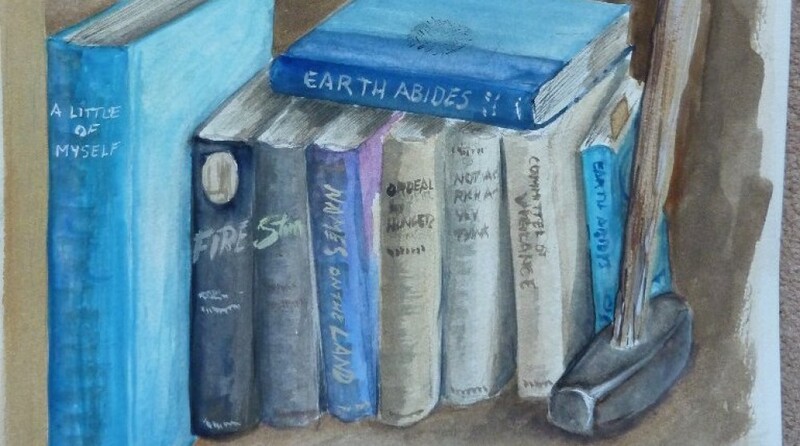 His masterwork Earth Abides, for example, can be seen as the pinnacle of his ecological novels – the books in which the ecosystem, not humans, is the protagonist. And readers of this web log will now also know that Stewart’s ecological best sellers, published long before Earth Day or the rise of the Environmental Consciousness, certainly helped bring that Consciousness about. It is a milestone, too, in sharing those honors which he is increasingly gathering. 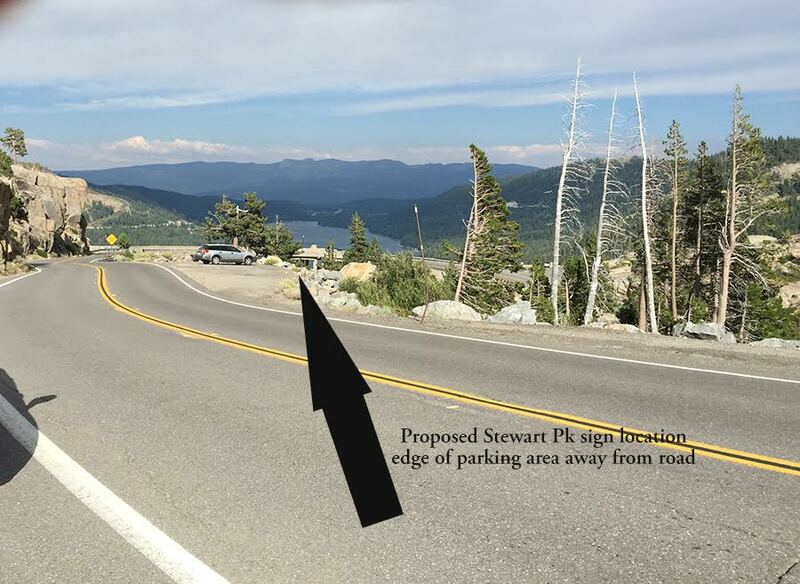 The interpretive sign at Donner Summit is in place during the summer when the old highway he immortalized, U.S. 40, is open to traffic. The GRS ePlaque is now online at the Berkeley Historical Plaque site. (Someday, if funding is found and permission gathered, a physical plaque could be placed at the site of Stewart’s San Luis Road home.) Junlin Pan, Chinese scholar, is well along in her difficult translation of Names on the Land for an immense Chinese audience eager to learn about America. The sheet music for Philip Aaberg’s Earth Abides is soon to be published, thanks (like the US 40 sign) to the contributions of friends of Stewart. And, just perhaps, there’s an Earth Abides mini-series on the horizon. It’s been a pleasure and an honor to have been part of these things. New GRS Interpretive Sign, Donner Summit, Historic U.S. 40, just above the Rainbow Bridge and Donner lake, and just below George R. Stewart Peak. Along the way of the weblog, we’ve been reminded of how Stewart’s work still directs us, and encourages us. One of the great Stewart interpreters, for example, recently refused to sign an illegal loyalty oath in his unenlightened college system – a college system in a state whose voters salivate over the chance to pack weapons into diners, but apparently have little use for freedom of thought. Surely, that Stewart interpreter, that hero of thought, (a famous poet and author), was inspired by Stewart’s Year of the Oath. And as the ecosystem gets our attention through climate change, we can all be reassured by the ecological novels that humans can survive and transcend any such changes. one, he had enjoyed some fine meetings along the way. That is true for this web log, as well. It’s brought us into conversations with a professor at Temple University, well-known author Christopher Priest, and several dedicated Stewart fans, who’ve all shared their experiences with Stewart’s books. It brought into the light a remarkable 1929 silent film of George R. Stewart and his parents, visiting his wife’s Wilson relatives in Pasadena – a film now copied, thanks to Ross Wilson Bogert and his son, and placed in the Bancroft, other Stewart collections, and the collections of the Stewart family. So we’ve done a lot. And if this weblog needs to take a break, it’s earned the right to do it. But the site will return, because there’s much yet to discuss. Stewart’s friends, for example, like C.S. Forester and Wallace Stegner and Bruce Catton and Frost and Sandburg and all the rest. And there will be news, of that you can be sure, about George R. Stewart and his continuing influence on us all. Thanks to you, readers, for enriching and expanding this weblog with your comments, your encouragement, your suggestions, your support, and your continuing interest in things Stewartian. 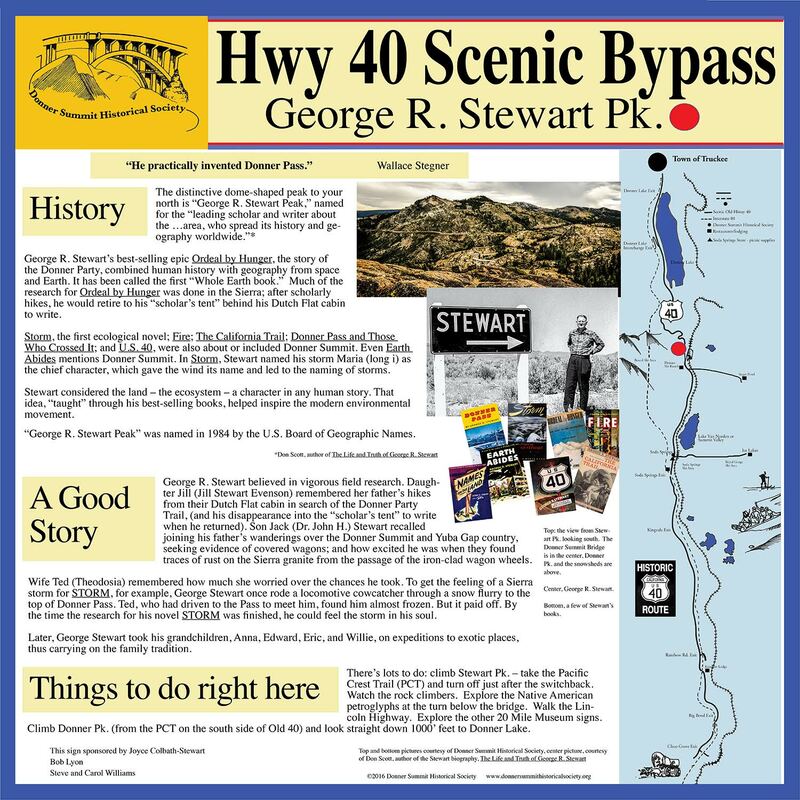 October’s issue of The Donner Summit Heirloom has a series of articles about George R. Stewart, or topics that relate to Stewart’s subjects. 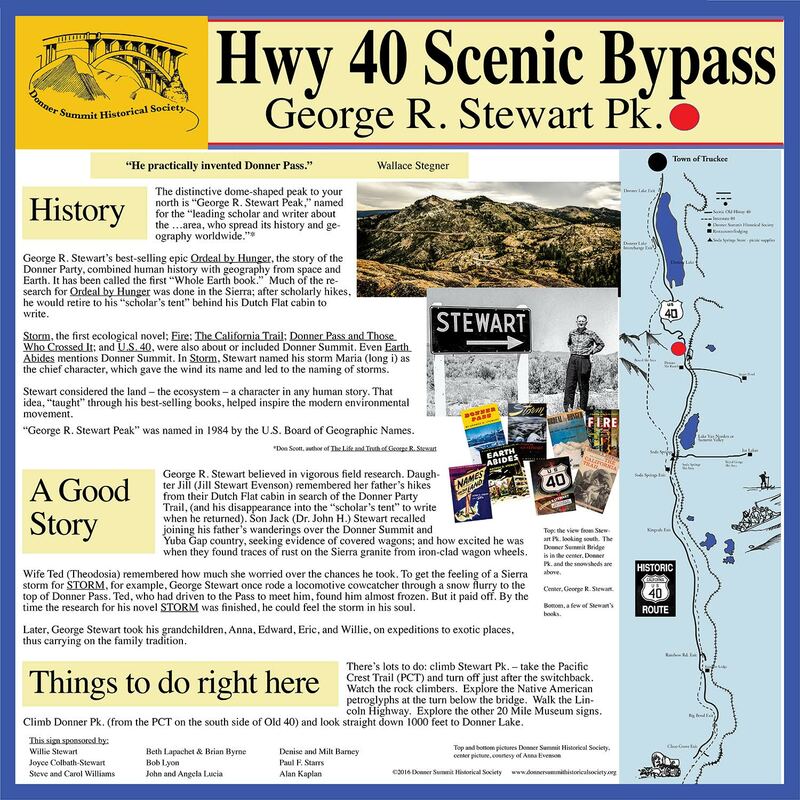 There’s a good article about the search for the California Trail route over Donner Pass, which includes some information about the Lincoln Highway route – think Stewart’s U.S. 40 and The California Trail – a review of Stewart’s landmark work, Ordeal By Hunger, a description of the new George R. Stewart interpretive sign. There’s also my article about Stewart, with an emphasis on his connections to the Donner Summit area. It gives a good overview of the man and his work. If you’d like a quick introduction to GRS, you’ll find the article – and the other articles – useful. By the way, if you have an interest in GRS, or Donner Summit, or Lake Tahoe, you might want to join the Society. It costs little, but supports the historic preservation and interpretation of the area. 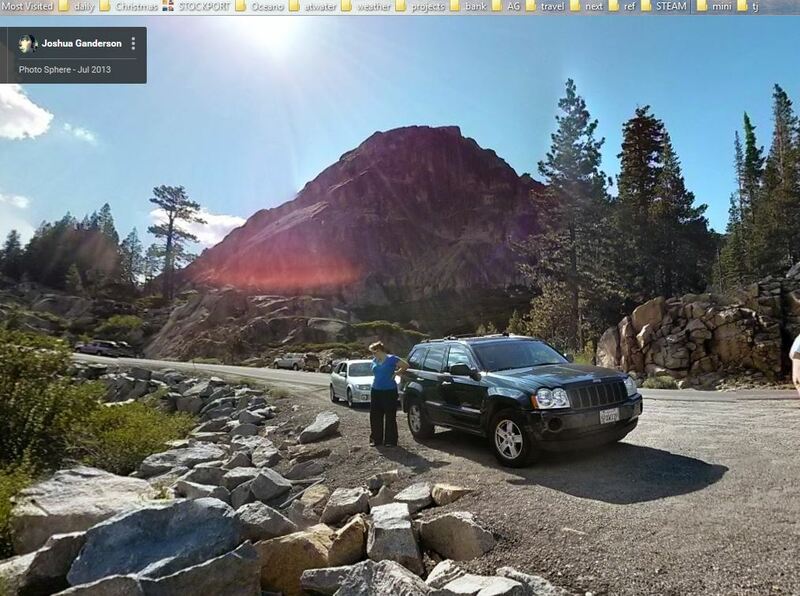 Bill chose the location with care, and it’s perfect: A parking area which overlooks Donner Lake, Donner Peak, the historic “Rainbow Bridge” on U.S. 40, and the Summit of Donner Pass – which would have been the route of the first covered wagons over the Pass. The parking area is close to the Pacific Crest Trail, too, The PCT crosses U.S. 40 not far beyond the left (west) side of this photo. 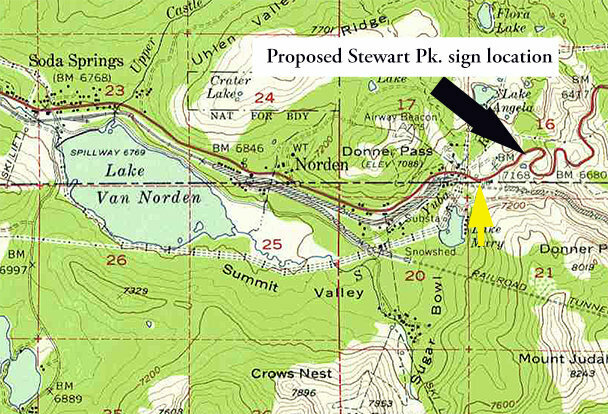 Here’s a map from Bill which shows the PCT crossing – yellow arrow – in relation to the sign location at the parking lot – black arrow. It’s a short walk – always face traffic! – to the Trail Crossing; from there, it’s a short hike and scramble to the summit of George R. Stewart Peak. The directions are on the new sign. Let’s all hope to meet there some day in the summery future, and do the hike. Afterward, we can have a picnic – Ted (Theodosia) Stewart loved picnics – and read from Stewart’s books. Beth Lapachet and Brian Byrne, also campers and colleagues for many years. Bob Lyon, Founder of The Friends of George R. Stewart, Stewart Scholar, and Encourager of all things Stewart, who first introduced Steve Williams to the Friends of GRS.